Media attention for Atelier Vie has poured forth in recent days, with three press hits from diverse sources. The article was inspired in part by our inclusion in the March 2016 issue of Bon Appétit, which listed their picks for top urban distilleries across the country. The Advocate article includes mention of our spirits, awards, and availability around town. Trade publication The Equipped Brewer has expanded their coverage to include distilling, with an article by Nora McGunnigle on “How to Choose the Right Distillery Equipment.” Atelier Vie is featured, sharing some tips on equipment selection and do-it-yourself strategies. 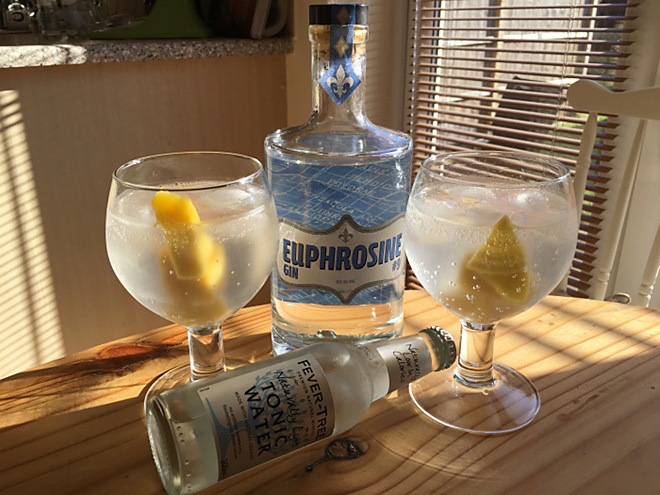 Last, but certainly not least, The Gin Shelf, a gin blog in the United Kingdom, recently acquired and reviewed a bottle of Euphrosine Gin #9. Intrepid gin reviewer Matt Burton came to our attention via an Instagram posting of a bottle of Euphrosine flanked by a pair of generously sized Gin & Tonics. Matt’s acquisition of the first known bottle of Euphrosine Gin #9 to cross the Atlantic is due to the kind offices of his friend Jez Green, a British expat living in Arkansas, who sent him the bottle. Read the entire article and let us know what you think! This entry was posted in Atelier Vie, Press Hits and tagged atelier vie, distillery equipment, euphrosine, gin, new orleans, press hits, spirits. Bookmark the permalink.